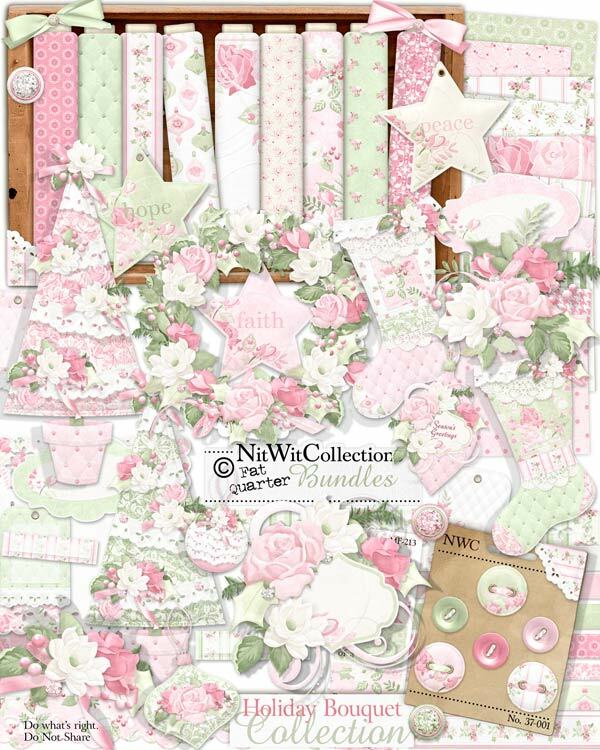 "Holiday Bouquet" Collection delivers Christmas in style with this Christmas Rose inspired Collection. Beautiful pinks and greens are the colours to show off these gorgeous flowers, Christmas trees, stockings, ornaments and more. It certainly gives Christmas an elegant depiction in order to create your scrapbook layouts and Christmas cards with. Maybe it will even inspire your home decorating ideas for this year's Christmas splendor?! 3 Bows - what is wrapping and Christmas without bows?? 2 Christmas trees that are already decorated for you...one in pink and one in green...you choose! 2 Labels - I think you know how to use these! 2 Stockings - maybe there are only 2 because some people are on the "naughty list"?